This is a key table from Demographia's 2017 International Housing Affordability Survey. It relates to "major housing markets" with over 1 million inhabitants - usually large metro areas. One of the benefits of Demographia's work is that the same national databases have been used for more than a decade to chart changes in housing affordability using the same measure: Median house sale price/Median household income. In a nutshell, the answer to this question has a lot to do with the way councils are funded. In jurisdictions where local decision-makers stand to gain from new development, they will be much more eager to make it happen. In Germany and Switzerland, council budgets largely depend on their ability to attract new residents and taxpayers. This is why both countries are have traditionally had a more responsive and flexible housing supply side. The available financial incentives to planners and councillors made all the difference to house prices in the long run. (Bold added). The key figures in these two tables is the average annual population growth rates of major metro urban areas of Germany and Switzerland. I haven't gone back earlier in history, but it is generally accepted that the population increases in these countries is low, and given the age demographics show that death rates exceed birth rates, the forecast is for populations to slowly decline. There may be other policies adopted in these countries to change that long term trend. The point I'm making here is that population increases in the urban areas in these two countries has been between 0.3 and 0.4%/annum on average. Population growth has been almost an order of magnitude greater. Growth and development patterns, and the related political economies, in the metro areas of Sydney, Auckland and Vancouver may be comparable. But they are very different from metro areas in Germany and Switzerland - too different to draw the kinds of conclusions that Mr Hartwich draws in his introduction to the Demographia housing affordability survey. The data graphed here are from the Demographia Survey report tables ES-2 for the years 2011- 2017. To be fair, a variant of this graph is presented in the Demographia report but is not given the prominence it deserves. An explanation of the pattern observed - that Auckland's affordability index is spiralling away ahead of the indices for Australia and Canada. This might be explained by Auckland's relatively higher population growth rate, combined with the fact that Australia and Canada are implementing more effective controls to manage demand. One thing's for sure, because Auckland, Australia and Canada are all implementing smart growth land use policies to restrict sprawl. Yet there are other significant policy influences in effect. These need to be revealed and understood. Simply citing Germany and Switzerland as exemplars for a strategy where house prices are kept low by liberal land release policies does not cut the mustard. Every now and then - maybe it's the heat or maybe it's the silly season - someone really lets go in the Herald's opinion pages. It's not that I see red, it's that I see the words that are used, their meaning, and their interpretation. And I remember that we (society) has been here before, many times. Whether it was that compulsory life belts were wrong (against human rights and choice), that cigarettes were actually good for the health (doctors smoked and they couldn't be wrong), that human activities are not changing the climate (this one's disputed - I know - science is still pending), that current high levels of immigration are "about right" for New Zealand (also disputed - I know), and - on the other side of the ledger perhaps - that New Zealand's councils are wrong to regulate dairy farming's relationship with water. "Recently while I was in a shop doing business, a very self-righteous lady loudly pronounced that I was one of those irresponsible farmers who allowed their cows to "pee and poo" everywhere resulting in our rivers all being polluted, writes Malcolm Lumsden." "I quietly replied to her that over her lifetime, she would pass as much pee and poo as a cow because she would probably live 11 times longer." Ed: Now that comment - if you really said it - says more about you than it does about her. Sounds like you got real hot under the collar and gave her the sort of verbal whack normally reserved for the Council chamber. Bully-boy tactics. There was a letter to the editor that pointed out your maths didn't take account of the fact there'd be 11 cows worth of pee and poo in her lifetime. That lack of math doesn't reflect well on your argument either. How do your other scientific arguments stack up? "She would also use all manner of chemical substances for her health, washing herself, her clothes, and dishes, all of which would ultimately enter the water via sewage pond discharges. As well she will send tons of toxic rubbish to landfills, and own vehicles that will pollute the roadside waterways with toxic residues." Ed: Ignoring the spurious argument about the car - talk about flailing around - let's talk about human poo and pee for a moment. In New Zealand most of it goes into the loo - as you very well know, being a Regional Councillor - and it's piped to a waste water treatment plant. Solids are separated and bathing quality wastewater gets discharged (I know there are exceptions). Solids mostly go to landfill - not because of what she puts down the loo - but because industry is allowed to put toxic waste down the sewer. Now I know that's not a perfect system, but it's a damn sight better than letting cows pee and poo onto fresh soil and grass. "She was not impressed with my response. Our rivers were the most polluted in the world she retorted." "I reminded her that by international standards, the Waikato is the fourth cleanest river in the world. In fact I said, my dear old cow Daisy will on a really hot day only consume about 70 litres of water, compared with the urban average usage of 200 to 230 litres per human." Ed: What international standards are you using here? According to Wikipedia's list of Rivers New Zealand, the Waikato is one of more than 500 New Zealand Rivers. Do you really believe the Waikato is the fourth cleanest river in New Zealand - the best case reading of what you said. You must know that dozens of NZ rivers run from mountain to sea without going anywhere near human habitation. Unlike the Waikato which drains dozens of farm catchments not to mention more than a dozen waste water treatment plants. Seriously. "Our 6.4 million dairy cows only drink about 500 million litres per day compared with 4.5 million people using 900 million litres per day." Ed: Your water consumption comparisons are laughably selective because you ignore the water used to grow Daisy's grass let alone the water used to wash down the milking shed. "Daisy I said, will spread her waste naturally on the soil where it will be filtered and used by plants." Ed: I could accept this part of your argument to describe NZ dairy farming before the days of Fonterra and dairy industrialisation. In Southland and parts of the Waikato dairy farming has been managed in ways that don't damage natural waters. Problem also is - as you well know - when too much pee and poo is spread by Daisy (and she's not a smart beast) then it washes over the plants and through the soil and into the groundwaters below. Where it slowly accumulates, taking years to wash out, and nitrating the aquifers. "On the other hand human waste gets piped away and will basically have the solids removed before being discharged into waterways, chemicals and all. Stormwater is full of nasties from the concrete urban jungles and roads, and goes straight into waterways." Ed: As a Regional Councillor you should know very well that two wrongs don't make a right. Just because some human activity can be dirty, doesn't justify permitting intensive dairy which adds to that damage. (Remember cumulative effects?) In any case all discharges from human wastewater treatment systems have to be consented, reach monitored standards in most larger urban cases, that the treated wastewater should meet swimming standards. This is a core issue. Pee and poo from individual cows does not have to get, or satisfy, any discharge consent. You are not comparing apples with apples. A fatal argument I would say around any Council Chamber. "So why, I asked, are you picking on Daisy who lives a toxin-free lifestyle, consumes few resources, and discharges a pittance of what humans do into our environment? Daisy I suggest is also more productive than most anti-farmer advocates." Ed: Well yes. But apparently the same land used to grow grass could also grow other crops. And you mustn't forget - if you want to tell the whole story - that New Zealand has to import thousands of tons of Palm Kernel oils from Asia which come from land cleared of bush by fires causing people in Malaysia to suffer smoke-related health problems. With respect - it's not the argument here. Though distraction can be useful to win a Council debate. The natural resource that is being affected is the natural water resource. You could equally well argue for more coal-mining and more iron sands mining in New Zealand. The opportunities have to be weighed against the costs. That's what good and balanced Regional Councillors are expected to do. "Gasping for rebuttal, my lady then said we should become organic farmers. Look at Cuba, they are still growing food and have had no fertiliser for years. Well I responded, science says organic farming cannot feed the world and needs twice the land of modern farming to produce the same amount while being less environmentally friendly." Ed: Good old 'science says'. I don't know which books you've been reading. The opposite is true from what I read. It might be true to say that some prefer the taste of dairy milk to soy milk - but soy and similar products use less resource (add in water and energy and include the complete life cycle) to produce the same food value. "But I conceded I would be happy if she wanted to reduce her standard of living to that of the average Cuban with a rate of pay similar to those workers in Cuba. It would certainly reduce my rates bill. As I walked away, I heard the man behind the desk say to the council lady, "You picked the wrong fella to have an argument with today." I felt quite uplifted in the knowledge that the argument can be had. The fact is, most good urban folk only get one side of the story." Ed: You were the right man for that lady to challenge. You are a Regional Councillor to make sure agricultural economic development takes place in ways that do not damage natural waters. You know that. If she doesn't think you're doing that properly, she's right to challenge you. "Green extremists and others such as Dr Mike Joy, who wants all dairy cows removed from New Zealand by 2050, are never challenged as to what this will mean for New Zealand. Basically they want all meat, milk, and other animal products removed from our diets. By masquerading as environmental carers, the socialist greens anti-farmer campaign is conditioning people to believe farmers are the enemy of New Zealand. This is economic sabotage based on populist ill-informed rhetoric that is short on facts and science." Ed: You need to look in the mirror when you make statements like this, mate. What you've put here is woefully short of science or fact. There is no acknowledgement that over the past five years dairy farmers have spent more than $1 billion improving the environment. Despite the anti-farmer misinformation campaign, the environment affects us all. Ed: Fonterra's annual earnings last year totalled $18.8bn. Five years of that = almost $100billion. And that's after paying the farmers. I think $1billion to clean up their practices - 1% - is not much in the scheme of things. Many rivers in New Zealand have been severely damaged by intensive dairy farming. That's still happening. It needs to stop/or solutions need to be found and paid for. This rhetoric has infiltrated the Waikato Regional Council's new Plan 1 change which will allow the council to control every farm activity by means of a farm plan resource consent. The council will dictate land use, stock numbers, fertiliser use, what type of crops may be grown and where, plus much more. Farmers in Taupo, who are ahead of the rest of the region, are now being told they must provide the council with their annual financial accounts. This amounts to nationalism of agriculture. Urban businesses that have an impact on the environment will be next. Ed: You will know that Councils are cash strapped doing their job. In an urban setting Councils use the Government Valuation of your property to calculate the rates you pay to cover the costs of services. It's a proxy for user pays with an element of ability to pay. Dairy farming accounts would work the same way - the more you earn from the land and its waters - the more you can afford to pay toward any regulatory costs. I'd say that's a fair approach - rather than making each farmer pay the same. Wake up New Zealand, if agriculture is hobbled by this socialist madness, and New Zealand continues to bite the hand that feeds it, maybe life in Cuba may start to look attractive after all. Ed: This is crazy stuff. New Zealand farming is highly unregulated - and could not be further fram being nationalised - unless you describe the Fonterra setup as national control of dairy farming and exports. Our rivers are nationally owned and public resources. So are the country's groundwater supplies. Just because you're a farmer doesn't give you property rights to do what you bloody-well like to that water. Good science and good governance at local, regional and national levels and good decision-making - based on science and fact not bullying - are essential. 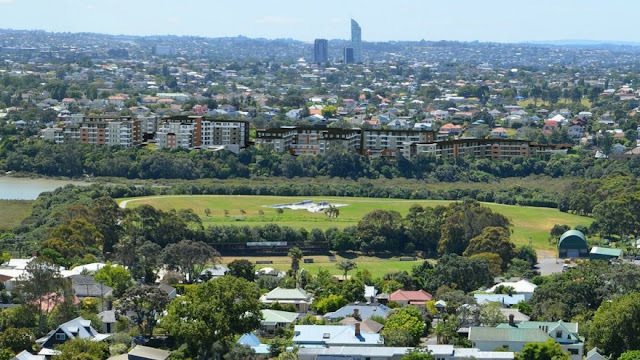 The decision to grant the controversial Rymans Retirement Village in Devonport is a test case of the application of Auckland Unitary Plan provisions contained in its Mixed Housing Suburban Zone - particularly in relation to the intensification of Navy/Ngati Whatua land precincts. The hearing of the application by Ryman Healthcare Limited to build a retirement village in Devonport, Auckland (see my critical preliminary posting here) was undertaken on behalf of the Auckland Council by Independent Hearing Commissioners Kitt Littlejohn, Dave Serjeant and John Hill. The majority decision to grant the application (dated 13 January 2017) has just been released. The decision to grant the resource consent was made by Commissioners Littlejohn and Hill, as a majority of the Commissioners appointed to hear and determine the application. For reasons that are separately recorded in the decision, Commissioner Serjeant would have refused consent to the application. The application was publicly notified on 16 September 2016. A total of 392 submissions were received, with 73 in support, 14 neutral and 305 in opposition. Twenty-nine submissions were received late, of which 2 were in support, 2 were neutral and 25 were in opposition. It is likely the decision will soon be available here (scroll down to "37 Ngataringa Road"). 34. During the processing of the application the Council notified its decisions on the recommendations of the Independent Hearings Panel on the Proposed Auckland Unitary Plan (PAUP) under clause 10(5) of Schedule 1 of the RMA. Subsequently, on 15 November 2016, the Council gave notice pursuant to clause 20 of Schedule 1 of the RMA that those parts of the PAUP not challenged by appeals were now operative. These statutory changes to the planning framework for the assessment of the application have had the effect of amending rules which had immediate legal effect upon notification of the PAUP (which the application addressed on lodgement), making other rules (and associated objectives and policies) in the PAUP legally applicable (and most recently operative) to the application, and making obsolete other rules and provisions of legacy plans that applied at the date the application was lodged. 49. The MHS zone standards are expressly varied for this site by virtue of the DPP provisions and therefore take precedence (OAUP Rule C1.6(4)). 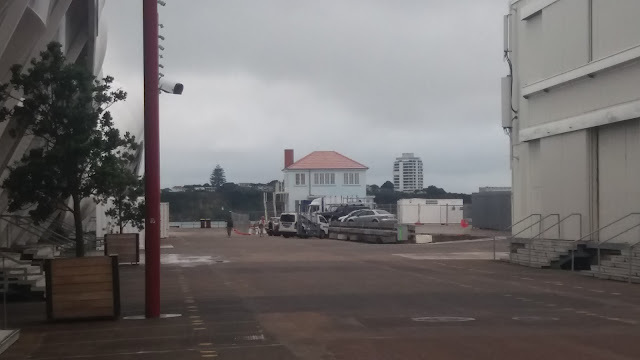 Of particular relevance is the standard in relation to building height, which in Precinct F (this site) is varied from the MHS zone permitted height of 8-9 metres to, depending on the location within the site (by reference to Precinct Plan), 8-9, 11-12 and 16-17 metres. It transpires that the main heighjt control for the site is 16-17 metres, and because there are some exceedances of that control, the application becomes fully discretionary. 152. In combination, the MHS zone and DPP rules classify an integrated residential development on this site that complies with the varied height and other related bulk and location standards in the DPP as a wholly restricted discretionary activity. Under the DPP provisions such an activity can be considered without public or limited notification, or the need to obtain written approval from affected parties, except in special circumstances (Rule I508.5 Notification). 155. Accordingly, in summary, we give weight to the effects on the environment that might result from development of the site in accordance with the applicant’s anticipated development scenario, which is based on a ‘compliant’ restricted discretionary (as far as land use is concerned) proposal.... we have no trouble in finding that the scale of the anticipated buildings and their enabled height on the site is considerable and that the differences between that anticipated scale of buildings and the scale of buildings for which consent is sought are comparatively small. We will bear these differences in mind when we look at the specific assessment matters that the OAUP provides us with when looking in particular at the design and external appearance of the proposed buildings. The bold section is interesting. The words "enabled height" reference the development potential inherent in the increased height control permitted by the MHS and the DPP, and "comparatively small" is the decision's pivotal description of the height differences between what is permitted and what is proposed. 173. The aspect of the proposal that was the focus of many at the hearing and also our own deliberations is the bulk, location and external appearance of the proposed retirement village buildings. We have been assisted in our analysis of these matters by the assessment criteria and matters for discretion for integrated residential development found generally in the MHS zone and specifically, for the scale of such development anticipated at this site, in the DPP. 181. We find that the bulk, height and location of the proposed buildings establishes a built form on the site that avoids wider dominance or visual effects. Our assessment of the proposal from the most distant viewpoints we were provided is that although it will be noticeable as a large built form, it will still sit comfortably in the urban residential landscape when viewed from those elevated locations. It is assisted in this outcome by the extent of foreground vegetation to be retained, the fact that it does not dominate a ridgeline or the horizon, and that its architectural forms and appearance are not uncommon features in these views. 183. We observe here that the enabled greater building height for the site is the method chosen by the DPP provisions to achieve the policies against which the proposal is then to be assessed. Consequently, a finding that a building of a complying height did not achieve the policy would be illogical. Of course here we are assessing buildings that do not fully comply with the DPP height limits. But in relation to the assessment matter, we are not persuaded that the additional areas of height result, overall, in the development having wider adverse dominance and visual effects. As the montages and elevations of the alternative options offered by the applicant show, it is difficult to discern the difference at first glance. I wonder whether this throw-away comment might come back to haunt! The reasoning in this paragraph may be why the decision does not engage with the Ryman offer to reduce the height of two of its higher buldings. At this point the decision engages with the dissenting assessment of Commissioner Serjeant. 186. Finally on this topic we turn to the key point of difference between ourselves and Commissioner Serjeant, whose dissenting reasons (set out later) we have had the benefit of reading in draft. We refer here to the assessment criteria which direct us to consider whether the building height establishes “an integrated built form” that ensures a mix of building heights and variation of built form when viewed from streets, public open space and residentially zoned areas with views of higher buildings being broken up by buildings of lesser height, thereby reducing dominance and bulk. 187. We consider that the proposed retirement village buildings do provide a mix of building heights and variation of built form when viewed from the outside in. Undoubtedly, the design of the buildings could have incorporated a greater mix of height and variation of built form. We accept the analysis of Commissioner Serjeant in this regard. However, we do not wish to be drawn into a debate on architectural design to achieve what are essentially qualitative criteria, particularly in circumstances where we are not satisfied on the evidence that requiring greater variation in height and built form is necessary to avoid or mitigate an adverse effect on the environment of the development. We also observe that the anticipated height and built form of a complying development on the site would not likely bring with it any greater variation than is currently proposed. • The variation of built form when viewed from streets, public open space and residentially zoned areas. 208. .....viewpoints are particularly important, as viewpoints from public open space are an essential part of the criteria. Assoc Prof Bird came to the conclusion that the proposal will have ‘less than minor’ adverse visual, dominance or overlooking effects on its various receiving environments. 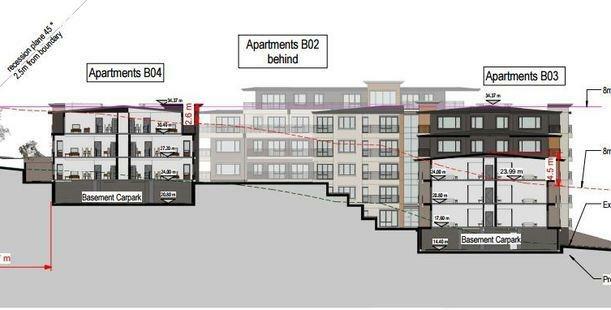 That is clearly not the case from Viewpoints 7 and 8 in particular, and likely other viewpoints from the south such as Viewpoint 17 on Lake Road where the buildings appear as a continuous line of multi-storey buildings, which is not the outcome sought by the criteria. In his conclusion, Commissioner Serjeant makes a number of points about the environmental and planning consequences of other integrated developments based on the decision's interpretation of the effects of the Unitary Plan provisions. 210. My conclusion is that the application should be declined. Unlike the majority decision, my finding is that the application fails on the facts in terms of its ability to meet the assessment criteria, and this failure is sufficient to decline that application given the strong focus on design issues in order to meet the DPP description. This application is the first to be tested against the provisions of the DPP that provide for the intensification of six areas, beyond that otherwise provided for by the underlying zoning. This intensification will generate significant change in each of these areas, subject to the assessment criteria referred to above (and likely no public input, given the non-notification provision). While acknowledging that this application is for a retirement village, and not a typical apartment development, it would be unfortunate if the interpretation of the DPP provisions were seen to support the proliferation of large bulky buildings that have little or no variation in built form and adopt an undifferentiated 16m height limit within Area 1. While the achievement of greater intensity is supported, this does not have to be at the expense of the existing environment or a quality outcome. I believe this is a very important test case for the future of Auckland - particularly an Auckland that aims to be the most liveable. Walked down the wharf to check it out. I think it will be quite an attractor - might as well have some useful interpretation explaining the state house background. 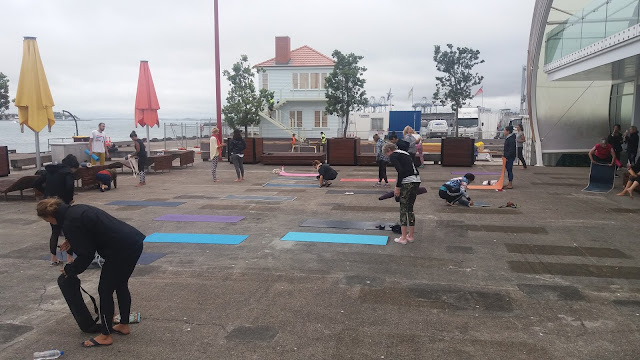 Discovered a free yoga class underway. When the chandelier gets inside should be spectacular. Especially at night. 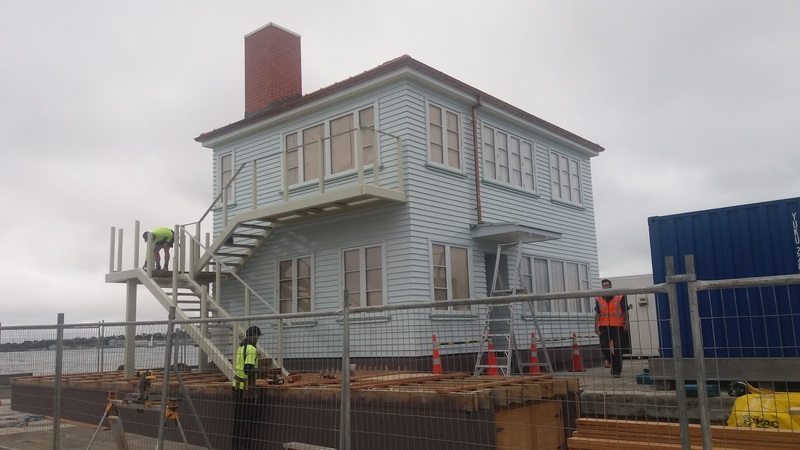 Wonder what the next piece of artwork might be for Auckland Central - and what will it mean? It's interesting times for planning in New Zealand. Since the Resource Management Act's (RMA) enactment in 1991 most national governance action around planning has been through the Ministry for Environment (MfE) and its Minister. This has been changing in the past few years - in part because of the affordable housing crisis. The Ministry of Business Innovation and Employment (MBIE) has become more interested and involved in planning. Its messages make for interesting analysis. This post contains a little bit of that. ...Local authorities impact on development and control land use through their Resource Management Act plans. Some urban areas in New Zealand are growing quickly, and the supply of space to meet housing needs isn’t keeping up with demand, so house prices in some areas are increasing much faster than incomes. The recent Productivity Commission inquiry into ‘Using land for housing’ found that local planning decisions are overly constraining the supply of space for housing. The Productivity Commission recommended that the Government prepare a national policy statement giving direction to local authorities to help address this. In August 2015, the Minister for the Environment and Building and Housing announced his intention to consult on the development of a proposed urban national policy statement. You can see how tight the timeframes are. They need to be because New Zealand's High Growth councils (Auckland, Hamilton, Tauranga, Christchurch and Queenstown) will need to submit their housing and business capacity assessments with MfE/MBIE by December 2017. Then we get to the body of the report. Net migration into New Zealand, and into Auckland specifically, has increased sharply since 2013. This consists of increased permanent and long-term arrivals, as well as lower than usual permanent and long-term departures (Figure 1). A comparison of migration with growth in rents and house values shows some historical relationship between rents and net migration: rental growth peaked in mid-2002, at the same time net migration was at its height. A relationship is expected as an influx of migrants entering an area could be expected to affect demand for housing and therefore rents. While we do not have enough data to examine house value growth during the 2002 migration surge, we can compare how house value growth and rent growth changed around December 2012, when net migration started to increase rapidly. Prior to this time, changes in house values had closely followed growth in New Zealand gross domestic product (GDP); from late 2012 Auckland house values grew rapidly while quarterly real per capita GDP growth rates have stabilised or declined. There is a suggestion in the data of net migration and house values moving somewhat together between 2004 and 2010, but both series are also closely related to general economic conditions. In the latest cycle the upward movement in price growth that began in 2010 substantively preceded the upswing in net migration that began in 2013. It is clear that, at most, international migration is only one of many factors that influences house values and rents. This graph compares the historical growth of house prices with the difference between rental yield (annual rents divided by prices) and interest rates. The purpose is to compare the price of the housing asset with how well it is performing as an investment (by comparing cash flows to costs of borrowing). Auckland house price growth has been gradually rising over the last four years, while its rental yield has remained roughly constant. In the June 2015 quarter there is stronger growth in Auckland house prices, while its rental yield is now showing a clear decrease. This suggests that the demand for investment properties is being driven by expected future price increases and not by higher rental income. Wow. Let's have some more data (and messages) like this please. Speaks the truth. Government's current emphasis on supply management rather than demand management tools to address housing price/affordability issues is not supported by the combination of these MBIE messages. Other statistics present in the MBIE Housing and Construction Quarterly report include social housing statistics and construction and consenting data. Extremely useful. "MBIE has decided to review the NZHCQ to ensure it does the best job of sharing housing and construction data with the general public. While this review is under way, we will not be publishing the NZHCQ in December 2015 or March 2016. We will be releasing our new-look building and housing reporting in June 2016. In the meanwhile, you can find a range of tables on the rental bond data page...."
It appears that the "new look" reporting has yet to appear.